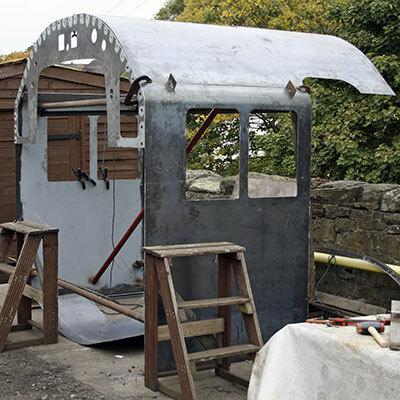 The cab sides with numerous temporary cross bracings in place were removed again from the chassis and set up on a concrete area nearby for the roof to be fitted. In the machine shop, the spring hanger forgings have been receiving attention together with the bearing housings for the brake shaft. Axlebox keeps have also been machined as has the dart for the smokebox door. The axleboxes for the driving wheels are all back from whitemetalling by a specialist firm in Birmingham and will be re-entering the machine shop in the near future. We understand from South Devon Railway Engineering that their work on the driving wheels may be completed this week. The pony truck wheels are now at Buckfastleigh for fitting of axles and tyres. 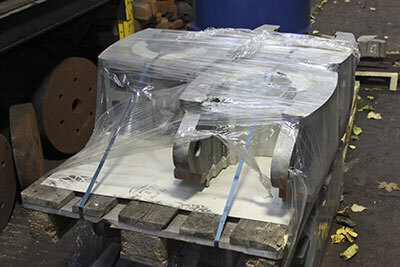 Castings of the expansion link brackets have been ordered and a steam brake cylinder has been ordered. 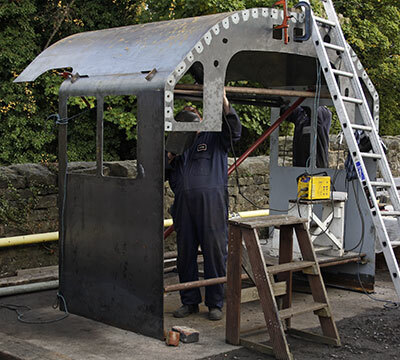 The first serious inroads were made into the boiler appeal account during the month, with the go-ahead given to the South Devon Railway to build the firebox and an up-front payment to Black Country firm Barnshaws for the boiler barrel. SVR Boiler Shop Manager Duncan Ballard was in the process of ordering the copper at the time of writing - and you can be assured that this will be stored under conditions of great security and at an undisclosed location! We are gearing up for possibly the biggest burst of publicity we've ever done to date. Can't say any more than that for the present - you'll just have to wait! Let's hope it will have the desired effect. This has proved a real winner, and Chris's plan has been to offer up components of the motion and valve gear, in reverse order of size; so we've got the forgings for the con rods, while the coupling rods, return crank rods and radius rods are all covered. Now Tony has suggested a slight diversion from this theme for the next items to be offered up, and so these are to be the two injectors (please forgive me if I'm telling you what you already know, but these combine steam and cold water to keep the boiler supplied). On BR Standards, both injectors are under the fireman's side of the cab and if you would like to sponsor one of these highly visible (and highly audible!) pieces of 82045, please get in touch with Chris. Each injector casting weighs in at approx £2,000, with a similar cost per casting for machining. 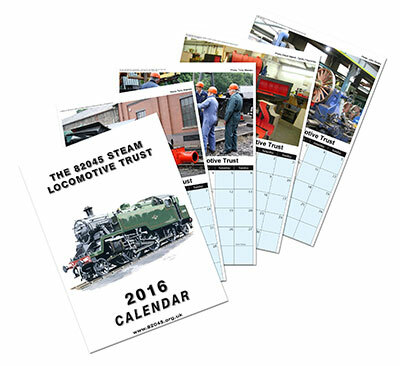 1: Don't forget the AGM: Saturday 9th April 2016 at 2.00 p.m., Kidderminster Railway Museum. 2: Tickets are still available for our next special train (Friday April 22nd 2016) The Eardington Flyer. Details from Bryan Clarke. Download the order form. The cab with half the roof in situ. Photo: Tony Massau. And a week later, the cab with full roof in situ. Photo: Tony Massau. The axleboxes after whitemetalling awaiting re-entry to the machine shop. Photo: Tony Massau.